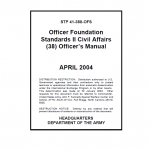 This publication supports the Army’s officer foundation standards (OFS) system of training. It provides Civil Affairs (CA) company grade officers the training and the knowledge they need to perform their duties. 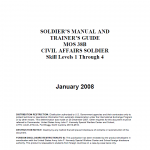 This manual provides the information necessary for Civil Affairs (CA) Soldiers to train for military occupational specialty (MOS) proficiency and includes self-development information that can assist the Soldier in lifelong learning and career development. An overview of the Army training process details the linkage and importance of the various elements that comprise the Army training process. The Commanders Emergency Response Program (CERP) funds were the primary mechanism employed by Det L in using money as a weapons system. CERP funds were most readily available and afforded CA flexibility and responsiveness. CA Marines also used Post-Operations Emergency Relief Fund (POERF), an International Security Assistance Force (ISAF) NATO fund available for named operations. With the MEB higher headquarters (Regional Command-South) able to authorize single expenditures of up to 17,500 Euros (approximately U.S. $23,301) and as much as 70,000 Euros (approximately U.S. $93,204) available at a given time, the benefits of POERF included the ability to fill gaps when CERP was not available or could not be used due to statutory restrictions. For example, governed by ISAF SOP 930 and described as having fewer bureaucratic hurdles to overcome than CERP, POERF was used to rapidly fund programs such as providing emergency financial assistance to internally displaced people who were forced to relocate due to MEB military operations. End-State: Civil Affairs forces capable of performing civil reconnaissance, mapping the human terrain, performing conflict based civil analysis, and providing the civil component to the Army and Combatant Command’s civil common operational picture enabling USG cooperative analysis and engagement.